Supreme Court confirms juries' critical role with sentencing-related facts | Jon Katz, P.C. 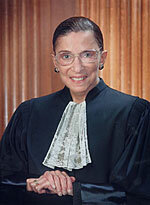 Justice Ruth Bader Ginsburg wrote the majority opinion in Cunningham v. California. (Image from Library of Congress website). In January, the Supreme Court further confirmed juries’ critical role in determining sentencing-related facts. The case is Cunningham v. California, ___ U.S. ___, 2007 U.S. LEXIS 1324 (Jan. 22, 2007). Under Cunningham enhanced sentences are improper if based on judicial fact finding rather than on jury fact finding reached beyond a reasonable doubt (at least where a jury trial is available in the first place): “If the jury’s verdict alone does not authorize the sentence, if, instead, the judge must find an additional fact to impose the longer term, the Sixth Amendment requirement is not satisfied.” Cunningham, slip op. at 17. In the Cunningham six-justice majority upholding the Sixth Amendment right to a jury trial are Chief Justice Roberts and Justices Stevens, Scalia, Souter, Thomas and Ginsburg. Thanks particularly to the conservative Justices Roberts, Scalia and Thomas for being true to the Sixth Amendment, as well as to Justices Stevens, Souter and Ginsburg. The dissenters are Justices Alito, Kennedy, and Breyer. Jon Katz.